The laser engraving shown is an exact reproduction of the Form A population census document that was filled in for this household on Sunday 31st March 1901 and Sunday 2nd April 1911. We managed to preserve the authenticity of theses historic documents and reproduce the documents by utilising old natural reclaimed slate. The slate is slightly larger than the original forms. The authenticity is further valued by our guarantee that no modifications or alterations were made to the original census document information. We do however spend time conducting electronic cleaning, Photoshop enhancement and adding borders on the original electronic copies to enhance the quality of the final reproduction. 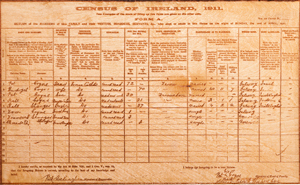 This specific Form A document was downloaded from the 1901/1911 National Archives Census website www.census.nationalarchives.ie – all information is available to the 70 million worldwide Irish Diaspora. Our natural reclaimed slate reproductions of the 1901 and 1911 forms are also available for the England, Scotland and Welsh census that were conducted on the same dates. 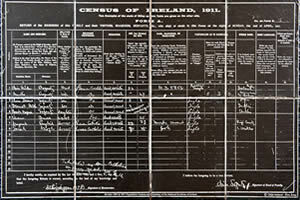 The image opposite shows the census form of 1911 on wood. Reviewing the form you can identify the family in question and all the relevant details in terms of members of the family, age, gender etc. 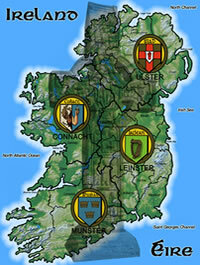 For further information on the census, please contact us.